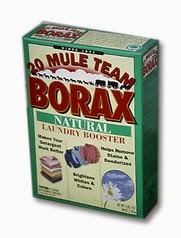 20 Mule Teams...they made Borax so famous, it's still around. And you remember when your mother used it. At the Borax Museum we learned about the history of Borax Mining in Death Valley. The Museum built in 1883 as offices and bunkhouse for the mining operations. 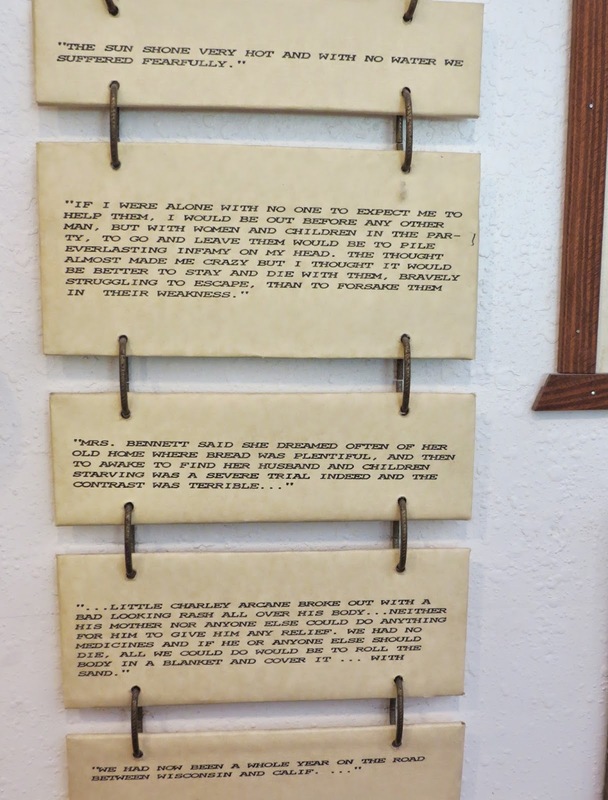 There were interesting stories about the Gold Rush of 1849 and the parties that tried to take a short cut to California gold fields through Death Valley. This was before the discovery of borax. This is an account of the Bennet-Arcane party. How Death Valley may have got its name. Borax was first discovered by prospectors looking for gold. When prospector Aaron Winters realized what he had on his claim was borax, he sold his rights to the William T. Coleman Company for $20,000. Coleman built the Harmony Borax Works near Furnace Creek. Site of Harmony Borax Works. Borax Refinery ruins and mule-team wagons. Wagon beds for hauling borax were 16 feet long, four feet wide and six feet deep. The rear wheels measured seven feet in diameter, the front wheels, five feet. The last wagon hauled water. The wagons filled with borax and the water tank weighed 36 1/2 tons. The Harmony Borax Works consisted of two dissolving tanks, eight settling tanks and 57 crystallizing tanks. From the valley floor, workers gathered impure borax in pieces ranging from pinhead size to 12 inches in diameter. They loaded the mineral into carts, hauled it to the mill, and dumped it into a mixture of water and carbonate of soda. The solution was then drawn off into vats in which rods had been suspended. Borax crystallized on the rods, was knocked off, and piled up to dry before shipment. Chinese laborers were hired to "harvest" the borax from the valley floor, and also to build the roads over which the mule teams traveled. The truth is there weren't always 20, and they weren't all mules. Usually it was 18 mules with two draft horses on the wagon tongue. The lead mules wore bells when the wagons were loaded with Borax, so returning teams with empty wagons could hear them and get out of the way. An attempt was made to replace the mule team with a steam tractor in 1894. 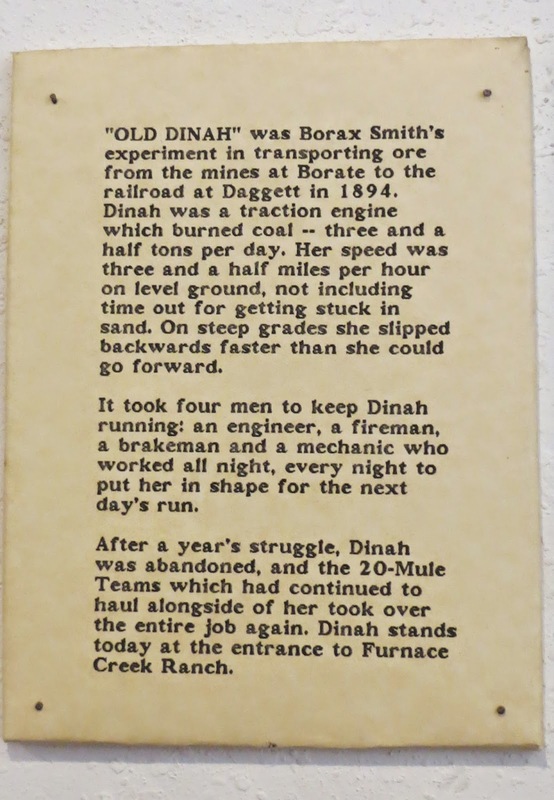 Old Dinah is on display in front of Furnace Creek Resort today. Apparently the mules were more reliable. Old Dinah at work in 1894. Furnace Creek Inn was originally built to accommodate borax company officials who came to Death Valley to check on operations. It later became a luxury resort. The 20 mule teams lost their job in 1890 when a narrow-gauge railway was built to Death Valley. The price of borax tumbled when borax was found in more hospitable locations, and was no longer profitable in Death Valley. So Death Valley turned to tourism. How about this for a trip? Full moon over Death Valley on our last night there. We are now at Zion National Park in Utah for the next 10 days. Have cell and internet, so that's good.